We remember with longing when lentil was one of the most important crop of our village and in our area, in general. When we were kids, we went to harvesting lentil with our parents and grandparents using a small Bertolini mower (as you can see in our video where our friend Pedro still harvests his lentil in that way) and after that, we made lots with our wood pitchforks. Suddenly, lentil disappeared and garlic became the most important crop in our area. Only few farmers continued sowing lentil until a few years ago. Nevertheless, for several years, lentil have had a good price and a lot of farmers have come back to sow them, who are saving money. On this campaign, we have followed their example and we have planted about 14 hectares of lentil. 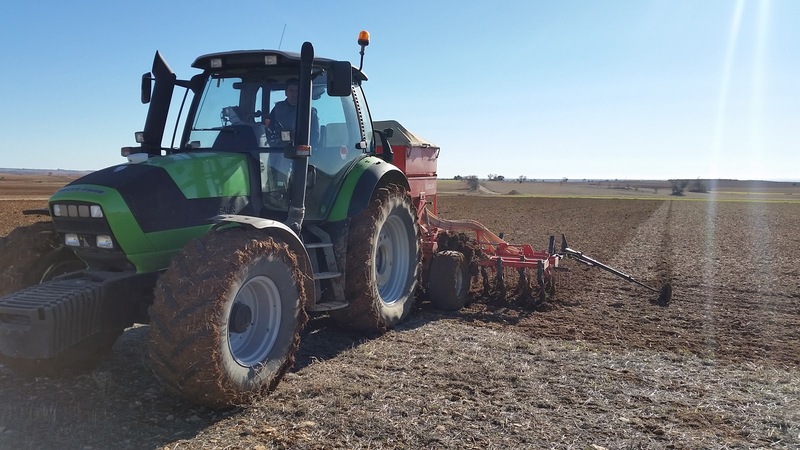 We really like pulse vegetables crops and they are ideal for crops rotations in our farm because they generate a lot of nitrogen which help us to sow cereals next year. In fact, we don't sow sunflowers (it is very typical in our area) because it was replaced by pulse vegetables. In addition, with the regulations of the new CAP, the pulse vegetables have taken an important role in Spanish farms. When we had to choose the variety of lentil, we decided to sow "Castellana lentil" because the price is more attractive... on the other hand, it is really much more delicate. We had the possibility of choosing from a large variety of seed with different prices. A lot of farmers sow "Pardina lentil" (small and black) because it is a less delicate crop. The company, which is our provider, sell farmers "Pardina lentil" with a contract where farmer has to return the 150% of the seed used, after the harvesting, and the price of the production is of 480€/te. We decided to sow "Castellana lentil" because the price of the production is higher (about 750€/te) but we have to pay seed (800€/te) in advance (sort and clean seeds). We sowed last week and after that we compacted the soil to help lentil growing up. The dose used of seed is of 150kg/he. Castellana: large (between 7 and 9 millimeters) and light green. It is the most commonly consumed lentil. It is also known as blond or queen lentil. Blond of Armuña: cultivated in Salamanca. Big size and yellowish color. Verdina: medium size (about 5 millimeters). It is used in salads. Pardina: small size (between 3 and 5 millimeters). It is very used in stews. Beluga: small, rounded and bright black. Used in dishes of haute cuisine. Its shape is similar to caviar. Uradity: white, from India with a high protein content. Du Puy: greenish color from France. With sweet and spicy flavor. Crimson: ideal Turkish lentil for purees. Roja Chief: orange Egyptian lentil. Ideal for soups, sauces or purees. To sum up, we would remark that some farmers have required to follow the evolution of our crop, so we will tell you how it evolves and even how we will harvest it, since it is an important issue since it cannot be harmed due to the fact that damaged lentils could not be sold for human consumption. Regarding this topic, performances, etc., we will talk to you next summer.